Jolina Petersheim has stories in her to tell. Granted, everyone has a story that they could tell, but not every personality has the ability to tell a story in an artful manner which makes them worthy of publication. (Yes. That is a very snooty statement. But I can make it because although I think I have stories to tell, I know well enough that I'm not skilled enough as a writer to begin telling them.) Petersheim, however, is proving she has what it takes to write a memorable, poignant story and I thoroughly enjoyed reading her new tale, The Midwife . If you will recall, I read her debut novel last year and I liked it well enough to know that I'd be curious to read more of her work. I was excited to receive a copy of The Midwife in the mail, courtesy of Tyndale House Publishers. I noted that the book was not due to be released until this month (June) so I put it on the shelf to pull out in due time and was delighted to realize that the time had finally arrived. I plucked the book off the shelf and sat down to read and discovered myself unwilling to get back up again except for severe life interruptions. 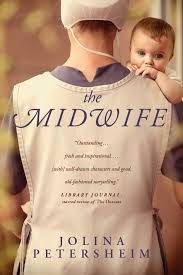 The Midwife is positively enthralling. The story opens with an introduction to a young graduate student by the name of Elizabeth Winslow. She has volunteered to be a surrogate mother for one of her professors and his wife. However, complications have arisen with the pregnancy causing the biological parents to wonder if the child should ultimately be granted a chance at life. We flip back and forth between Elizabeth in the early 1990's to the present day where we observe Rhoda Mammau. Rhoda is the head midwife at Hopen Haus which is located in an Old Order Mennonite community. Hopen Haus operates as a place of refuge for single women who discover that they are pregnant. These women can come and live at the house at no charge while they are pregnant and receive prenatal care, boarding, and camaraderie, should they desire it. We meet several young ladies within the pages of The Midwife and the mystery of the book is how each one of their lives intersect. The Midwife can be labeled "Christian Fiction" which I normally don't read because I think the genre is typically written very poorly. However, I think Petersheim writes memorable stories well. If she did try to preach a sermon in the book, she didn't do it in words which I remember; she preached a sermon through thoughtful storytelling. I appreciate that very much and have no hesitations in offering this book up for your consideration. I am pleased to announce that Tyndale House Publishers has offered to give away one copy of The Midwife to one of my readers here at Reading to Know. Would you care to win? Simply leave a comment below (including a valid e-mail address!). This contest is open to U.S. Residents only and will be open through Friday, June 27th. THIS CONTEST IS NOW CLOSED. THE WINNER (as selected by Random.org) IS Bluerose's Heart. Congrats! Many thanks to Tyndale House Publishers for sending a copy of this book my direction in order to facilitate this review. I received no additional compensation and all opinions are 150% my very own. I'm always interested in adoption stories. And midwife stories. Although I share your evaluation of the genre of Christian fiction, you have me wanting to read this book, whether I win the giveaway or not. Thanks! This novel sounds intriguing, thanks for the opportunity to win a copy! I've been watching my library's e-book page, hoping to see this one added. If you recommend a Christian fiction title, I'll give it a try! I have to admit my first thought after seeing the cover was, "Sigh, yet another Amish book." I'm glad that is not the case. I'd definitely like to give this a try. Would so love to win it to read! Definitely adding this one to my want-to-read list! Adoption, worthwhile christian fiction. . . I've been reading great reviews of Jolina's books so have her books on my "want to read" list. Thanks for the chance to win The Midwife. I would love, love, love to read this book! It sounds interesting. Thanks for your thoughtful review and for the offer! I would like to read it; I am an adoptee. This sounds like the PERFECT read for me right now! Thanks for your review. I would love to read this book! I read Jolina's first book and can't wait to read this new one. This book sounds extremely interesting and one I would very much enjoy reading. Thanks for having the giveaway.